Pure celebrates tenth anniversary with Union Jack Evoke Mio radio | What Hi-Fi? 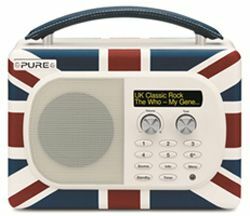 Pure is celebrating its tenth birthday by releasing a 'Union Jack' version of its Evoke Mio DAB/FM radio. The special edition radio will be available through leading electrical retailers this month for £150. Just 500 will be produced, each with a numbered commemorative plaque. "We are incredibly proud of the Evoke's success and proud to be flying the flag for British design and technology," says Colin Crawford, Pure's marketing director.